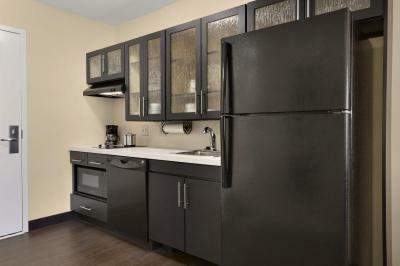 Lock in a great price for Candlewood Suites Vestal - Binghamton – rated 9.1 by recent guests! Nice place with really nice staff. I would definitely stay there again and recommend it to friends. Nice size room. Larger than most. We did not use the kitchen but would definitely bring food in the future. Full size refrigerator with a freezer, two burners, a microwave, dishwasher and pots , pans, utensils, cutlery, plates, etc. Excellent! Comfy bed. The size of the room and that they let my pet stay. Candlewood Suites is my recent pick: the hotel provides you with a kitchenette, plates, cutlery...and does not offer your a gross complementary breakfast which makes your stay cheaper. 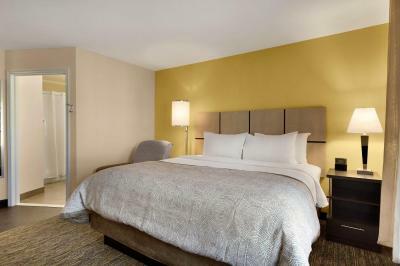 This hotel is located in the same plaza with Homewood Suites and Holiday Inn Express. It is the cheapest out of three, but all of 3 are good. The room was perfect for our stay with a stove, microwave and refrigerator. Everything from the lobby to the bathroom was in perfect condition. I'll definitely be back. My new first choice when visiting my daughter at college. The property is beautiful. The room was very spacious and clean. The staff the night we got there was outstanding. It was clean and very accomodating. Room Clean, staff friendly & rooms were beautiful! Mini kitchen was an unexpected bonus. Bed was very comfortable, I hit snooze a few times ! The facility was super-nice, exceptionally clean, even smelled fresh. The attention to detail (e.g. microwave popcorn made available on the counter; nice touch). The view of our room was a beautiful treetop view of the valley. If I had a reason to stay in the area again I would choose this facility. Candlewood Suites Vestal - Binghamton This rating is a reflection of how the property compares to the industry standard when it comes to price, facilities and services available. It's based on a self-evaluation by the property. Use this rating to help choose your stay! Located in Vestal, 1.1 mi from Binghamton University, Candlewood Suites Vestal - Binghamton has a fitness center and rooms with free WiFi access. Free on-site parking is available. 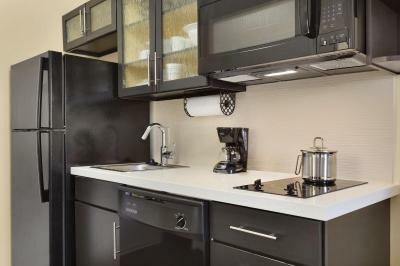 All rooms feature a kitchen, with a stove, refrigerator and microwave, as well as a seating area and flat-screen cable TV. A business center and a fax machine and photocopier are available on site. Guests can enjoy the outdoor gazebo grill at the property. The Roberson Museum and Science Center and Discovery Center are within 5.3 mi of the property. Wilkes-Barre/Scranton International Airport is 54 mi away. This property also has one of the top-rated locations in Vestal! Guests are happier about it compared to other properties in the area. This property is also rated for the best value in Vestal! Guests are getting more for their money when compared to other properties in this city. 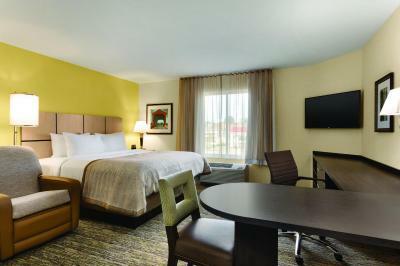 When would you like to stay at Candlewood Suites Vestal - Binghamton? 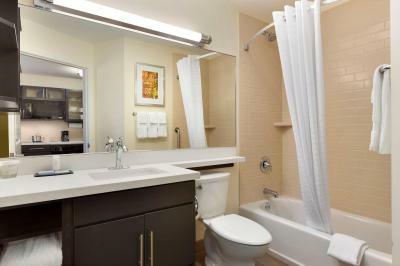 This studio suite features a kitchen, work desk and flat-screen cable TV. 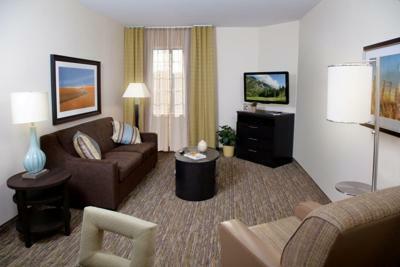 This suite features a separate living area, a kitchen and a flat-screen cable TV. 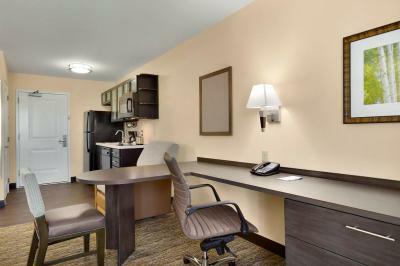 This room features a kitchen, work desk and flat-screen cable TV. House Rules Candlewood Suites Vestal - Binghamton takes special requests – add in the next step! Candlewood Suites Vestal - Binghamton accepts these cards and reserves the right to temporarily hold an amount prior to arrival. Nespresso machine would be perfect!!! No free breakfast and paper thin walls. There was no hot water for the first night. After a long trip, I could not take a shower. The electric oven didn’t work either. Their house keeping policy is funny, they don’t clean your room until you leave. I will not book this hotel anymore. HOTEL POLICY: NO HOUSEKEEPING FOR 7 DAYS??? How is this NOT articulated in ANY of the check-in collateral? Insane. Rate does NOT reflect lower level of service. DO NOT STAY HERE IF DAILY SERVICE IS EXPECTED. Only clean once a week. I almost fell in the bathtub because there were no non slip strips or mat to prevent a fall. I had to warn my husband to be very careful. I did call the front desk that morning and it rand many many times but no answer. I went to the front desk and the lady was preoccupied with her computer when I went to tell her about the danger of falling in the tub. She just said OK and didn't show any empathy or apologized. She knew I was angry at her lack of response so as I was walking back to our room, she made a point to come over to tell me that she would tell management. later that morning as we were leaving we were asked how our stay was and I said "Not Good" and her response was "Have a Good Day". Very poor customer service. All I wanted was some empathy shown for my concern. They could have lawsuits with falls which I think all hotels/motels should be concerned about especially any type of safety issue to their customers. Shower pressure not that great. Wish they had breakfast.